During the transcription of Descendants of Robert Gluvar (hence forth referred to as Descendants) some additional research was carried out. The ScotlandsPeople website contains many of the Scottish records from 1538. Searching in mid 2009 based on the names and details provided in Descendants unveiled some more interesting details. All the birth and marriage parish records listed on ScotlandsPeople for Haddington under the name Glover or Gluvar can be related to the family and the lineage described in Descendants. 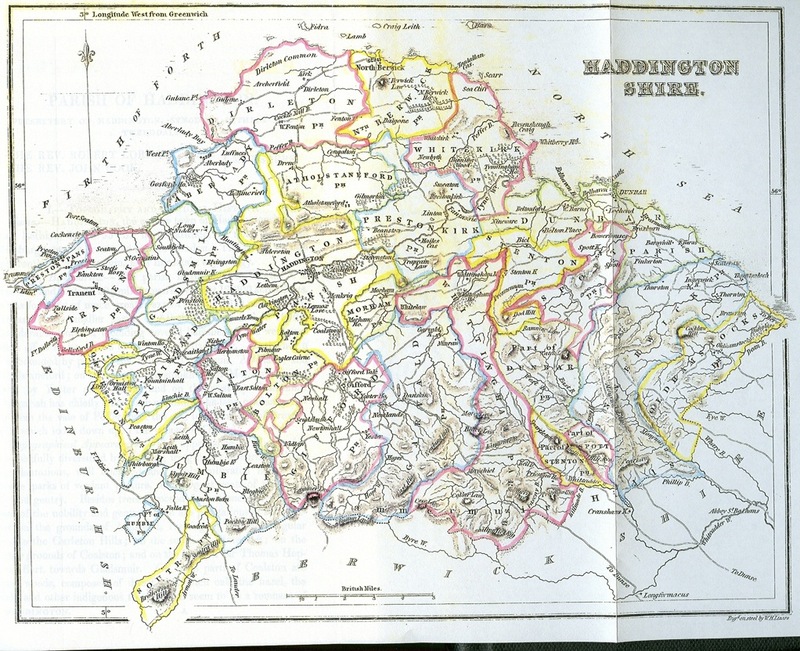 Haddington, circa 1845 from FamilySearch Wiki. The Will of Johne Gluvar, chapman and indweller of Haddington dated 25th October 1637 from the Edinburgh Commissary Court is available (reference CC8/8/58). Also available is the record of his birth, recorded as John Gluvar, son of Robert Gluvar and Margaret Gibsone in the parish of Haddington 15th July 1621 (reference 709/0010 0047). There six marriages list on the site for under the name of Glover in Haddington between 1538 and 1854. These include several referred to in Descendants, namely John Glover to Margaret Sheill on 24th October 1712 (reference 709/0060 0165) and then his second marriage to Beatrix Pow on 2nd May 1718 (reference 709/0060 0175); Archibald Glover to Janet Frood on 9th October 1708 (reference 709/0060 0159) and William Glover (the mason) to Agnes Scot on 22nd October 1812 (reference 709/0060 0427). Henry Barra in Gladsmund parish and Margret Glover in this parish to be proclaimed in order to marriage upon Sabbath the 24 March 1765 John Glover and Thomas Manderson Cautioners. In seems likely that this was John’s daughter, sister to Archibald and William. As is discussed in Descendants father’s were less rigourous in registering the births of daughters than of Sons. A search of neighbouring parishes also reveals that some parts of the family spread from Haddington. John Glover son of Andrew in 1654 appears twice in the registers. He is first recorded as baptised on 5th March 1654 having been born on 27th February in Haddington, with John Sheill and Andrew Gray as witnesses. A John Glover, son of Androw (sic. ), is also recorded as being baptised 9 days later in Pencaitland with the same witnesses. An Andro Glover of Pencaitland is also listed as having a daughter Margret baptised 8 years early on 13th April 1646. Unfortunately this entry is the last on the page of the register and the first line is barely legible and the second completely obscured, a John can be discerned as one witness but nothing more. This is four years prior to the date given in Descendants for Andrew Glover’s marriage to Elspeth Shillila, so we don’t know if this was a different Andrew Glover or an earlier marriage giving John an older half-sister (while we do not know Andrew’s date of birth his elder brother would have been 25 years old in 1646 so a guess of Andrew’s age cannot rule this out). There is no record available online for a marriage of an Andrew Glover of the right era listed under Haddington, Pencaitland or Gladsmuir. Rather latter on 16th September 1716, seven years after the birth of George, Archibald Glover and Janet Foord are recorded as having a daughter, Beatrix baptised in the parish of Gladsmuir. The very next entry in the Gladsmuir registers is for the baptism of another Glover, William, son of John Glover and Isobel Bane on 30th September 1716. However there is currently no evidence beyond his name to link this John Glover to the family as the only known John Glover contemporary with this was living in Haddington, married to Margaret Sheill, at this time. (John Glover and Isobell Bane’s children appear seven times in the Gladsmuir registers between 1712 and 1723 although this includes two repetitions, a son John appearing 1712 and 1720 and a William appearing in 1716 and 1722). July 3 Patk in this and Janet Glover in Pancaitlane Par. Consigned 3pd [unclear] and married. Again we only have the circumstantial evidence of her surname and Archibald’s marriage to Janet Foord already linking the families to suggest that she was of this family. Unfortunately the Prestonkirk registers give no Cautioners which might act as hint. There’s is also the fact that Janet is listed as being of Pancaitlane Parish, Haddington’s south-westerly neighbour. 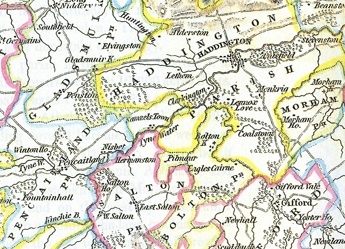 Similarly while Patrick is stated as being of Prestonkirk, Janet Foord is listed as being Haddington in the record of her marriage to Archibald. Another Archbald who moved away from Haddington was the eldest of John Junior’s sons by his second wife Beatrix Pow. While Descendants records him as marrying Margaret Forrest and having two daughters, Ann and Elspeth, he had a further five children having moved to Gladsmuir a few miles west of Haddington. These were Jean in 1745 who appears in both the Haddington and Gladsmuir registers for her baptism on 20th October of that year; Christian born in May 1750; John in February 1753; Margaret in April 1755 and finally William born in 1760. Two of these children appear to have been short lived as on the 13th July 1755 there is an entry in the Gladsmuir registers recording the hire of a Mortcloth for Archbald Glover’s child and on 25th January 1761 another for a Mortcloth for John Glover.